Purpose: The purpose of Mountain Work Days is maintenance of tree skiing. This involves cutting lines as well as setting aside areas for new trees to grow. Everything is done with hand tools. Work days are organized and led by Lars Bruns in consultation with ski area management. 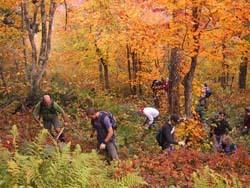 Mountain Work Days are a great chance to get out on the mountain, care for your favorite terrain, and learn about how northeastern mountain forests grow. It is fun and satisfying to see a ski line take shape, and how trees will grow in response to care. Turn Dividends: Each person who works a full day receives a complimentary day pass voucher for each day he or she works. The voucher is good during the upcoming 2014/15 ski season. You can work as long as you like, but plan on working the entire day to get a day pass. Report at 9 am at the Cricket Club picnic table. We're back down at 3:30 - 4 pm. Most of the time we hike from the base, so be prepared to hike. We always go, rain or shine. If it is raining, it is more of an adventure. The incidence of Lyme Disease is increasing rapidly in Vermont. This disease is debilitating and hard to get rid of. The 2011/12 winter was warm and brief, which benefits tick survival and reproduction. Be vigilant! More Info on how to protect yourself while trashing around the woods of Stark Mountain. Loppers are the most useful tool to bring. Make sure they are in good working order. The following tools are not allowed: All power tools such as chain saws, and swinging tools such as hatchets or axes. 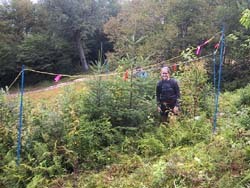 Catamount Trail Association schedules volunteer trail work days on weekends in October into the beginning of December. 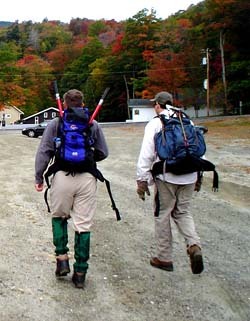 Help maintain and monitor the 300-mile backcountry ski trail that traverses Vermont!